I didn’t know what to expect from the Pier show this time with new promoters, but I was hopeful. Shows often get better, as the promoters usually increase the advertising budget and make other beneficial changes. Personally, my show was fine — much better than last March, and about as good as last November. Saturday was a good day, with moderately strong attendance, interest, and sales. Sunday was noticeably slower, with fewer people, fewer questions, fewer sales and less energy. Not what I predicted, but not a washout. 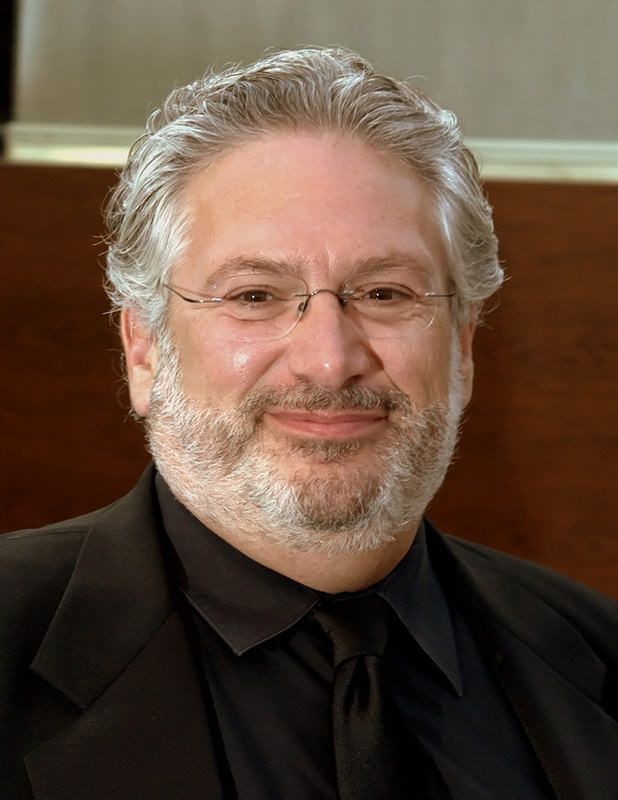 Harvey Fierstein stopped in for a few minutes on Saturday to inquire about a pair of Tiffany Studios root candlesticks (which unfortunately he didn’t buy). For those who don’t know, he’s a Tony Award winning Broadway star, and a gentleman. If you don’t recognize his face, you surely would recognize his very distinctive, gravelly voice. In asking around about results, I received the following comments. From a dealer in American art pottery, “Unbelievable. The best show I’ve had here in years.” A dealer in lamps and glass remarked “OK”. A dealer in Art Deco glass and objects “OK. Good. Better than last year.” A general dealer, new to the show said “Pleasantly surprised.” Another lamp dealer told me his show was “horrible”. A dealer in furniture and bronzes said he “did well, including some major pieces”, and finally a dealer in silver told me he had an awful show — not enough dealers to draw any general conclusions. The transition to the new promoters was fairly seamless, with only a few glitches. I was told that many dealers who double-parked during the night on Thursday received parking tickets, something that didn’t happen in previous years. My observations were that Andrea Canady, the show manager, and her crew, did a fine job. Setup seemed to go as smoothly as it possibly could. 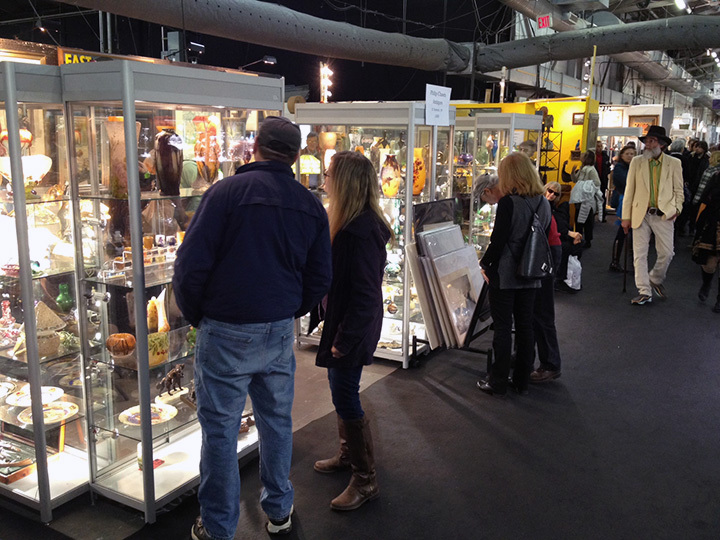 We’ll be busy buying for the next couple of months in anticipation of the important Florida shows, starting with the Miami National Antiques Show on January 24, 2014. We’ll end our winter schedule with the wonderful Grove Park Inn Arts & Crafts Conference, February 21 – 23, 2014. We last exhibited there a few years ago and couldn’t do it again because of scheduling conflicts. This year there were no conflicts, so we’re happy to return. It will immediately follow the important Palm Beach Antiques Show. The NYC Pier Antique Show will open to the public this coming Saturday, November 23, at 10 AM, and close the next day, Sunday, November 24, at 6 PM. U.S. Antique Shows recently purchased the show from Stella Show Management. New show promoters typically don’t buy shows to watch them fail, so they spend more money and make changes, mostly for the good. For example, I know the new promoters were able to sign some high-end dealers who usually don’t exhibit at this show. That will raise the quality. I also know they’ve spent more money on advertising, such as a full page ad in last weekend’s New York Times — mucho dinero. Sometimes a new promoter will start a show on a virtuous cycle that feeds on success and gets better with time. A case in point is the Baltimore Summer Antiques Show. It was owned and managed well for many years by Frank Farbenbloom. After he sold the show to the Palm Beach Show Group, the show only got better, with more and better exhibitors, more attendees, and better sales — a win-win situation. Now it’s the must-go-to show of the summer. This will be our last show of the year, so we hope to make it a good one by bringing some fantastic new items. 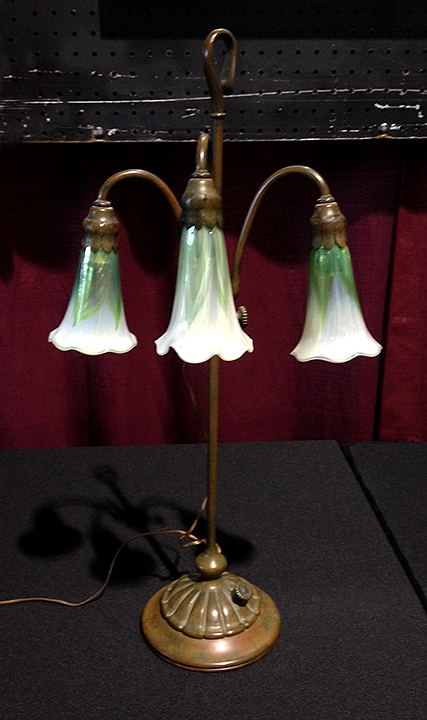 One is a Tiffany Studios 3-light lily lamp with rare green pulled feather shades. 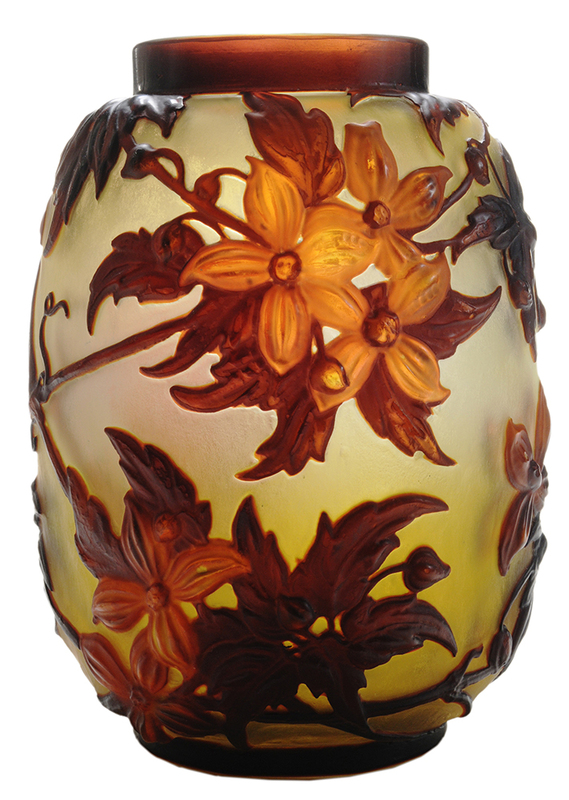 It’s one of 25, mostly Tiffany Studios, lamps we’ll have on display at the show. 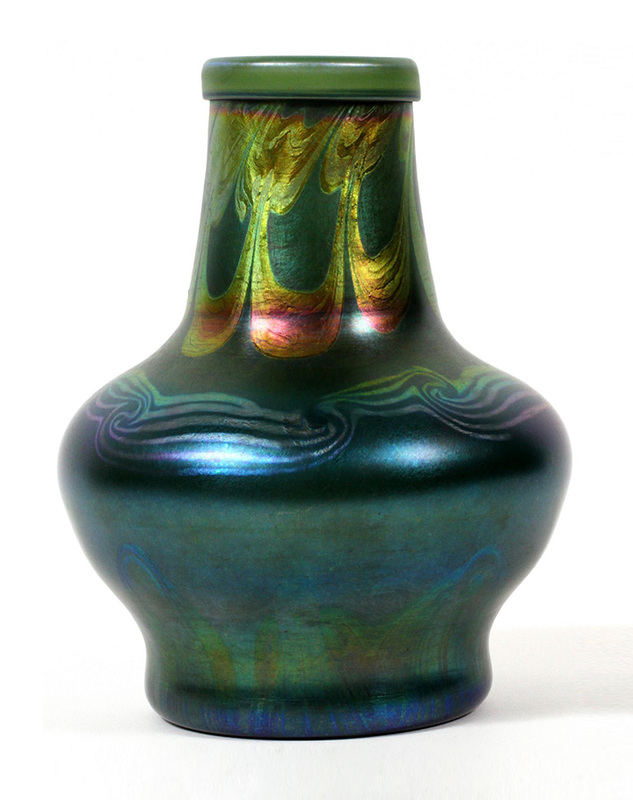 Another is a rare Tiffany Favrile decorated vase with applied handles, part of our fine selection of Tiffany Studios vases. After the Pier show, we’ll be buying up a storm for the important Florida shows in January and February. We just added a wonderful show to our winter schedule, the Grove Park Inn Arts & Crafts Conference, February 21 – 23, 2014. We last exhibited there a few years ago and couldn’t do it again because of scheduling conflicts. This year there were no conflicts, so we’re happy to return. It will immediately follow the important Palm Beach Antiques Show. Tune in Monday for the NYC Pier Antique Show results! Brunk Auctions held a diverse sale November 15-16, 2013. 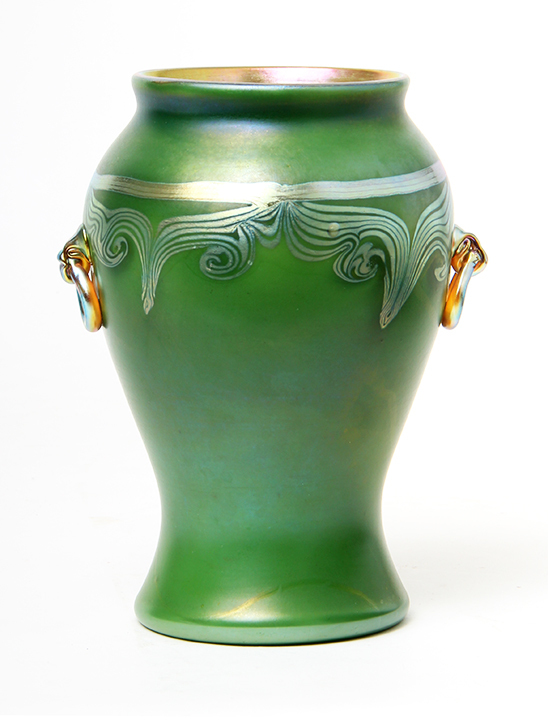 Many of the Art Nouveau items were from the estate of Dr. Laurence and Dorothy Grossman, of Nashville, Tennessee. Included in that group was a nice selection of French cameo glass. Lot #692 was a rare Daum vase with martelé-carved, applied cabachons. This was a lovely, rare piece, with a butterfly and gilding, that ordinarily I would have aggressively gone after, but did not because of the significant wear to the gilding. This is a perfect example of how I act as a filter. If it’s good enough for me to buy, it’s good enough for you to buy, and vice versa. It wasn’t good enough for my inventory — close, but no cigar. Regardless, it sold for $6,600, including buyer’s premium — well above its estimate of $2,000 – $3,000. 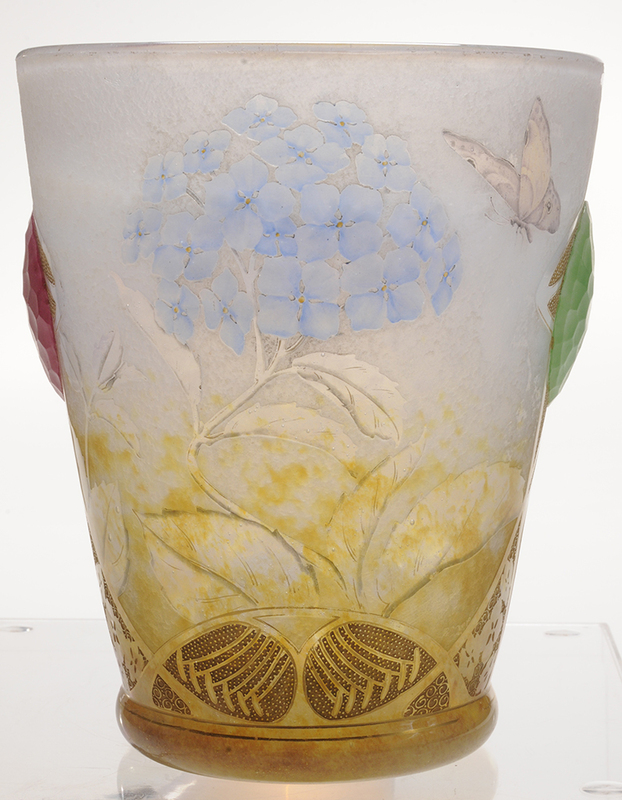 A nice Gallé blownout vase with clematis flowers was offered as lot #678, with an estimate of $2,000 – $3,000. Even though the color was only decent, it still sold for almost triple its high estimate, realizing $9,120. 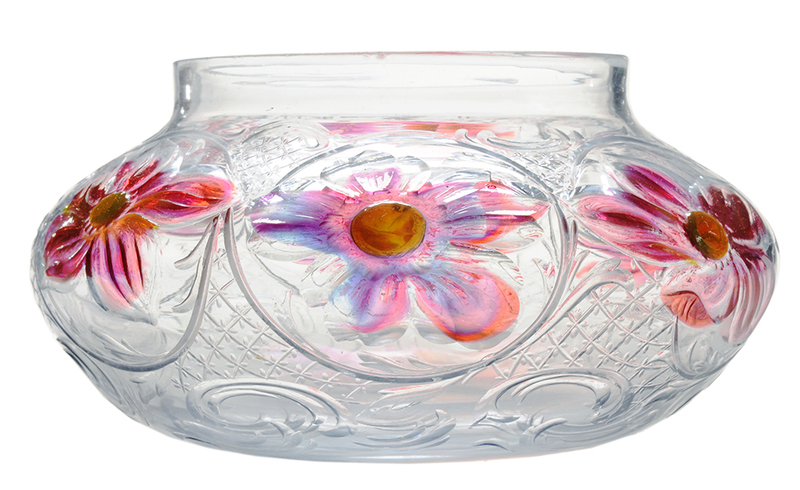 Brunk put a very low estimate of $1,000 – $2,000 on lot #672, a Tiffany Favrile padded and wheel-carved vase with pretty variegated pink flowers. The price flew past its estimate to sell for $8,400, even with a small chip to the interior of the rim. For the complete catalog, click here. As of today, the results haven’t been posted, but they should be by the end of the week. 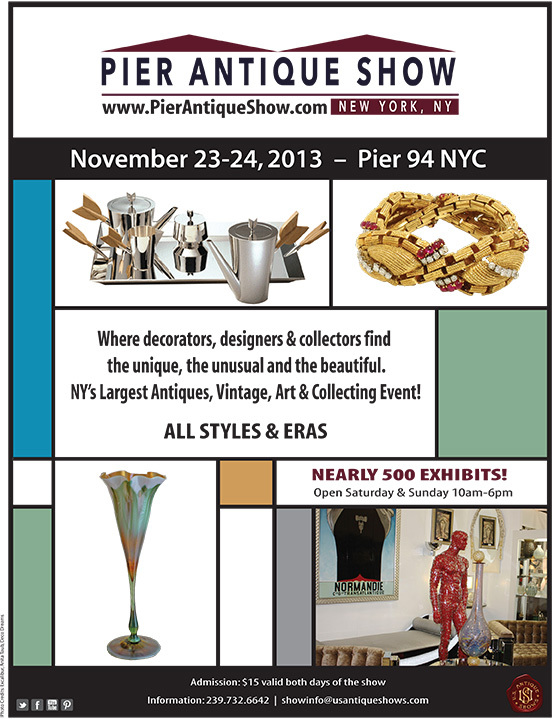 The NYC Pier Show will be held this coming weekend, November 23-24, 2013. The show is under new management, U.S. Antique Shows, which usually portends improvements. It will be our last show of the year, followed by the important Florida shows in January and February. We’re bringing some incredible new items, so don’t miss this show! 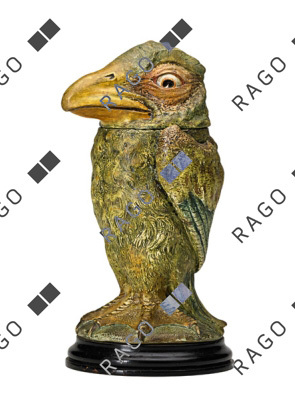 Heritage Auctions held their Illustration Art auction on October 26, 2013, with some impressive results. 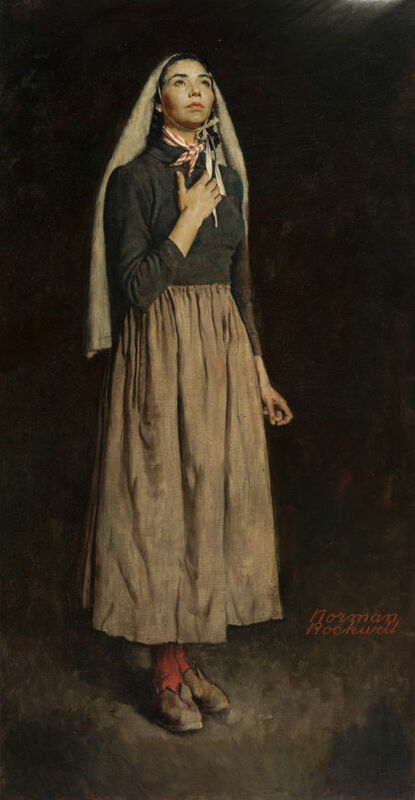 Norman Rockwell’s The Song of Bernadette from 1944 was supposed to be the highlight of the sale and it was. It sold within its estimate of $400,000 – $600,000, to realize $605,000, including buyer’s premium. Gil Elvgren is one artist who can be counted on to do well at an illustration art auction. His Lucky Dog (Dog Gone Robber), Heritage lot #78071, scored the biggest hit, selling for $173,000, against a pre-sale estimate of $50,000 – $75,000. This was the highest price ever paid for an Elvgren at a Heritage auction. Two other Elvgren paintings at this same auction sold for over $130,000. Steven Dohanos is another fine artist whose works command premium prices. 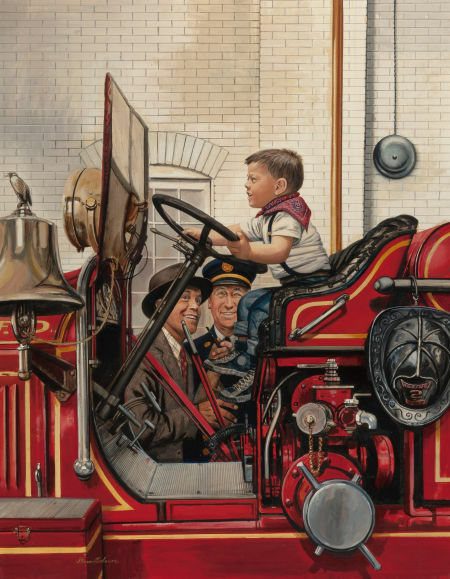 I was particularly enamored of lot #78014, The Future Fireman, the cover for the November 14, 1953 Saturday Evening Post. I wasn’t alone, as it soared past its pre-sale estimate of $30,000 – $50,000, to realize $106,250. For the complete results of the sale, click here. You will have to sign in or register for free to see the prices realized. 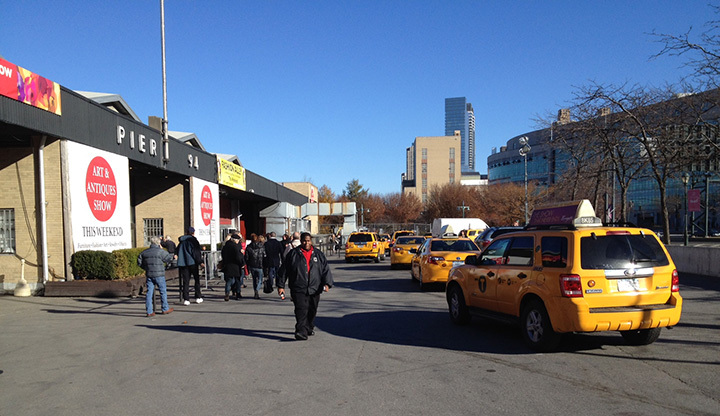 The NYC Pier Show will be held next weekend, November 23-24, 2013. The show is under new management, U.S. Antique Shows, which usually portends improvements. It will be our last show of the year, followed by the important Florida shows in January and February. We’re bringing some incredible new items, so don’t miss this show! 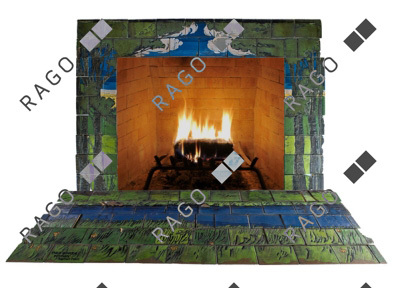 Rago Arts held an Early 20th auction on October 26, 2013, with some strong results. Leading the pack was a fireplace surround by the Saturday Evening Girls, for the private residence of Edith Guerrier, located near the Paul Revere Pottery works in Boston. It easily surpassed its high estimate of $150,000, realizing $219,750, including buyer’s premium. Martin Bros. birds are hot and have been for years, making it difficult for auction galleries to attract good consignments. Rago has been able to buck the trend with several sales of fresh-to-the-market Martinware. Lot #125 was an 11″ bird, with a pre-sale estimate of $40,000 – $50,000. It sold for $59,375, near the high estimate. 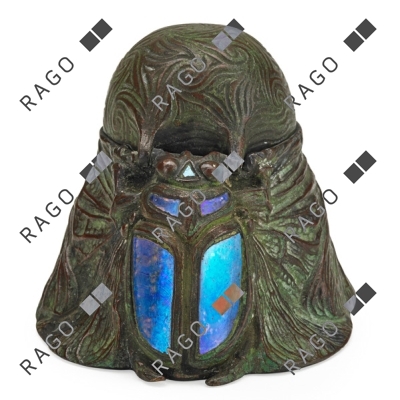 Of particular interest to me was lot #383, a rare Tiffany Studios scarab inkwell. It was a beauty, with curved blue iridescent inserts and a beautiful patina. It carried a very fair pre-sale estimate of $5,000 – $7,000. I bid strongly, but had to drop out when the price moved into retail territory, with a final sale price of $25,000. Oh well, can’t win ’em all. 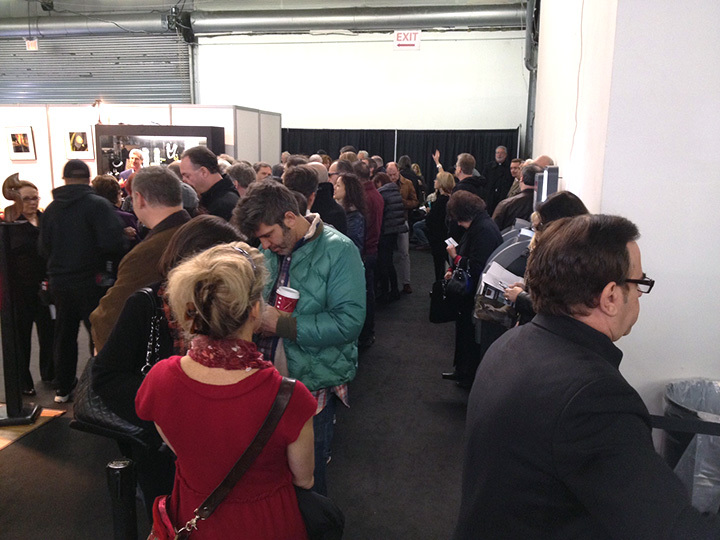 We’ll exhibit next at the NYC Pier Show, November 23-24, 2013. The show is under new management, U.S. Antique Shows, which usually portends improvements. It will be our last show of the year, followed by the important Florida shows in January and February. Today’s post is the first by a guest writer. William Robinson has spent most of his life working with antiques and fine art, while developing a family run business, Loveday Antiques, into one of London’s finest showrooms. Will’s passion for exotic wood and classic carpentry keeps his love of antiques strong. If you would like to be a guest writer for my blog, please submit your post to philchasen@gmail.com. I suggest you send me your idea first. If it’s interesting, illustrated, and well-written, I’ll be happy to post it. “Britain is world famous for hosting some of the largest and most prestigious antiques fairs in the world. A rich heritage and a natural affinity for antiques has resulted in Britain, notably England, being well stocked with a multitude of valuable antiques. Spotting a bargain, picking up a premium piece or simply admiring the beautiful craftsmanship from the rafters – antiques fairs around the world pull audiences from all sizes, shapes, ages and demographics looking for a day of culture and class. There are hundreds of antiques fairs and home shows that you could attend within the next year, but for the best experience I recommend the following three for their facilities and the exceptionally large variety of antiques that are available for purchase. 1. 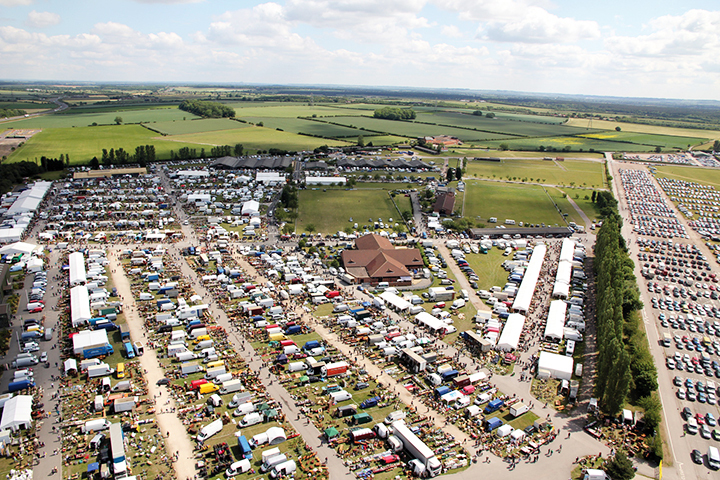 The Ardingly International Antiques and Collectors Fair is the largest antiques fair in the South of England and is hosted at the South of England Showground. This particular antiques fair is incredibly easy to access, as it is only an hour’s journey from England’s capital, London, and is just 12 miles from Gatwick Airport. The Ardingly fair is popular amongst a multitude of ages and has seen an increase in visitors of 28% since 2009. This increase may be due to the welcoming atmosphere. It’s a large event, but does not overwhelm the senses or feel crowded — an amazing feat considering the showground can hold up to 1,700 stalls. The fair specialises in a wide range of quality European ornamental and decorative items, with the smaller, more fragile pieces kept indoors, while the larger products such as wooden furniture, sculptures and household items are kept outdoors beneath marquees and tents. 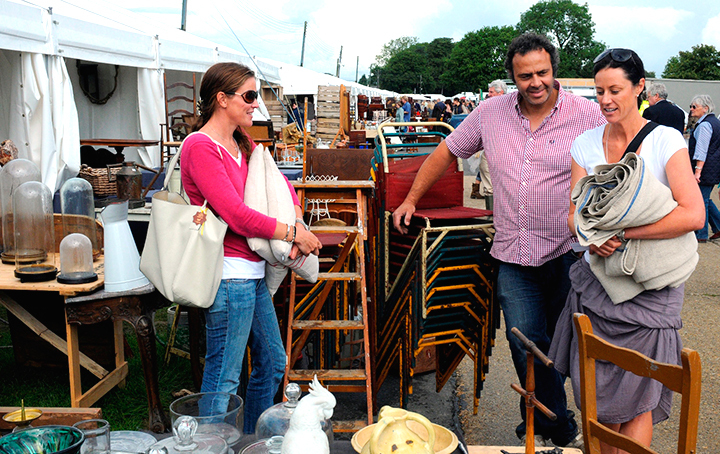 The Ardingly International Antiques & Collectors Fair will take place between Tuesday the 7th of January and Wednesday the 8th of January, 2014. Entry tickets for Tuesday are £20 and include entry for Wednesday; entrance to the event taking place on Wednesday is £5. 2. The Newark International Antiques & Collectors Fair is owned by International Antiques & Collectors Fairs Ltd (IACF) and has been crowned as Europe’s largest antiques fair, housing more than 2,500 dealers. Due to the remarkable number of dealers, the Newark antiques fair offers an amazingly diverse selection. It has become so popular that the IACF has run it up to 6 times a year. 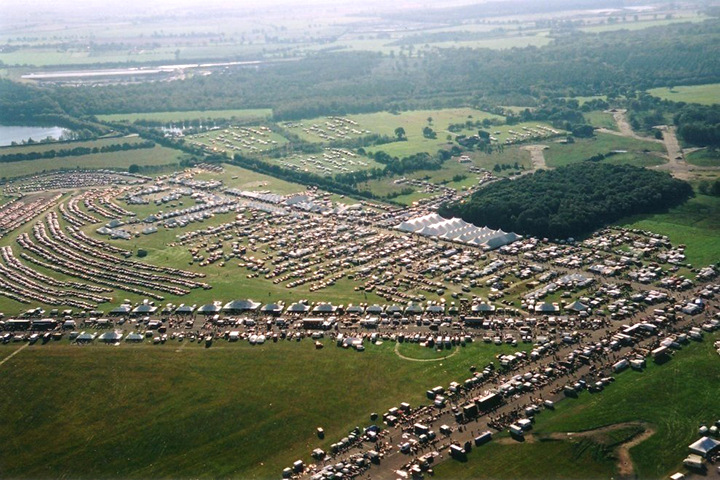 It is located at the Nottinghamshire Showground, with an approximate area of 84 acres. 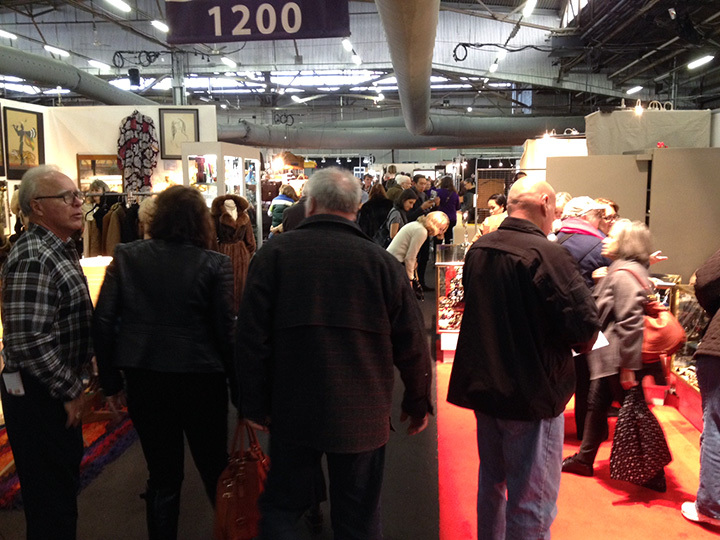 One of the beautiful things about the Newark International Antiques & Collectors Fair is that it began as a method for antiques dealers worldwide to stock up and share their knowledge with one another. Over the years, as vintage has become more and more intriguing for the younger generation, the fair now attracts audiences of all ages. The variety of people is almost as large as the variety of antiques available. The first antiques fair of 2014 in Newark will last from Thursday, the 6th of February to Friday, the 7th of February. Tickets for Thursday are £20 and include entry to Friday whilst tickets to enter on Friday are just £5. Next month we’ll be working from home base, exhibiting at the NYC Pier Show, November 23-24, 2013. The show is under new management, U.S. Antique Shows, which usually portends improvements. It will be our last show of the year, followed by the important Florida shows in January and February.